Ladbrokes has added lotteries to its many online offerings. Unlike the virtual games you may be accustomed to, these lottos play out using the actual drawings from real lotteries in Spain, the United Kingdom and the United States. You pick the numbers, set the stake, and even get to monitor the drawings as they happen. Click here to visit Ladbrokes Lottos! The most important point to understand is that you’re not actually playing the lotto. Instead, you’re playing through Ladbrokes, which is simply using the official lotto numbers posted. This approach avoids a lot of legal issues that would otherwise be present. It also gives you the option to set the stake. Just because a lotto ticket cost $1 or whatever in real life doesn’t mean that you’re limited to that amount. You can set the ticket amount, but note that Ladbrokes limits an individual’s winnings for any one national or state lottery to £250,000 a day. Playing is simple. Select the lotto you wish the play. There were four lotteries and nine drawings overall for us to choose from at the time of this review. Pick five unique numbers based on the requirement of the lotto you’ve selected. Alternatively, you can choose Lucky Dip, which will randomly determine the numbers for you. Note that most lotteries use six or seven numbers, but you’ll never pick more or have to match more than five. Most lotto tickets have a default price of £1, but you can increase this by entering the desired amount. Finally, confirm your bet. If you’d like to purchase multiple tickets and play other lottos, you can do that on the same ticket. When you’re all done, submit ticket. 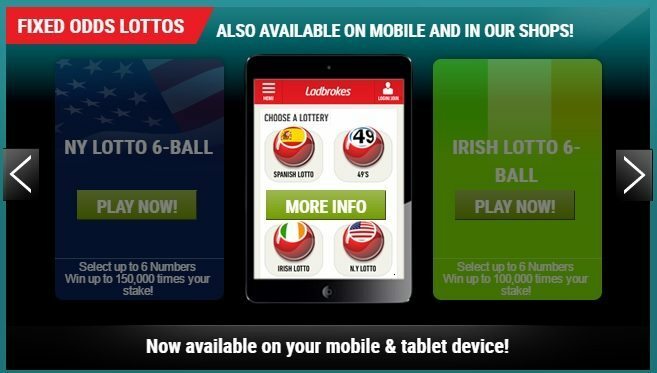 Ladbrokes also supports lotto on mobile devices, and unless your mobile device is new enough and powerful enough to support the desktop version of the website, you’ll need to download an app. Most iOS devices, including iPhone and iPad, are supported, and you can download that app via the Apple iTunes store. Android tablets and smartphones are also supported, and you can download that app either direct from Ladbrokes.com or through the Google Play store. 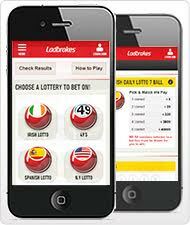 Once the Ladbrokes app is loaded, select Lottos on the left-hand menu. Then select the particular lotto you want to play, such as 49’s 6 Ball or N.Y. 7 Ball. Pick your five numbers, or select Lucky Pick to have Ladbrokes randomly select your numbers for you. Enter the stake amount if you want a ticket price other than the default. The app also supports multiple plays per ticket. Simply click “+Add more lines” to add another, and then click the “Confirm” button to finalize your purchases. Lotto play is quite good on the Ladbrokes app. In many cases, we’ll use the mobile version of a game because it’s convenient and not because it’s just as good. However, this is a case where it is, and we like playing lotto on our phone or tablet because its more streamlined than playing on the PC. All of the lotto games based on real-world lotteries that are available at Ladbrokes are fixed-odds games, which means that you know the odds and payout potential at the time you place the wager. The four national/state lotteries offered are the Spanish lottery, the New York lottery, the Irish lottery and 49s Limited, which is a United Kingdom lottery. Both 49’s lotteries occur twice a day, Monday through Sunday. The early drawing takes place at lunchtime, and the late drawing takes place at teatime. You have up until a minute prior to the drawing to place your bet. 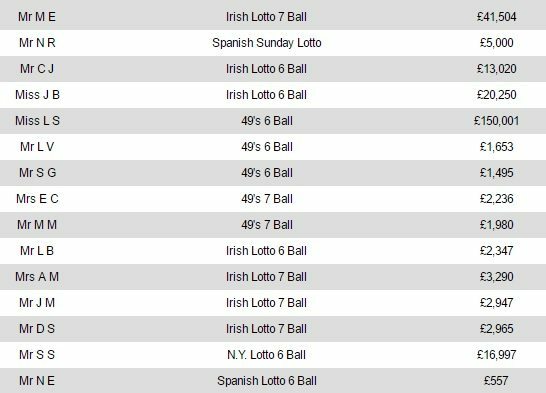 Both the Irish Lotto 6 Ball and 7 Ball lotteries draw on Wednesday at 8pm and Saturday at 8pm local time. Note that wagers must be finalized 15 minutes prior to the drawing in order to be valid. Both the N.Y. Lotto 6 Ball and 7 Ball drawings occur on Wednesday and again on Saturday at 11:21pm EST. You have up until a minute prior to the drawing to place your bet. The Spanish Sunday Lotto takes place at 11am local time, and you have up until 10:30am to place your bet. The Spanish Daily Lotto 6 Ball and 7 Ball drawings take place Monday through Saturday at 6pm, and you have until 15 minutes prior to the drawing to place your bet. Numbers are posted to the Ladbrokes website and app as soon as they’re drawn. Ladbrokes winners are also listed immediately. If you win, your payout is based on the Ladbrokes lottery payout structure. This structure varies per lottery based on balls drawn and total ball count. If you match one or more balls, then Ladbrokes applies the appropriate multiplier to your stake to determine your winnings. For instance, for N.Y. Lotto 6 Ball, Ladbrokes pays out 8, 75, 1K, 75K and 150K times for one, two, three, four and five balls matched, respectively. Therefore, if you matched three numbers and bought the ticket for £5, you would win £5,000. Check out some of the recent REAL winners! Be sure to read our review of the free Ladbrokes Sport bet as well as our Ladbrokes Bingo review!